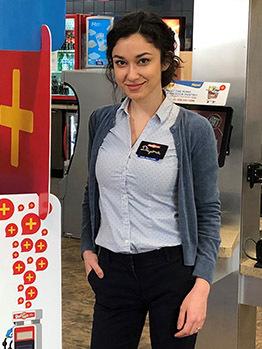 In Honor of National Women’s History Month: Meet Diyora, Sr. Store Leader at the Shaler GetGo! I joined Giant Eagle in 2015 and will be celebrating my 4th year with the Company this June. I am now a Sr. Store Leader for Shaler GetGo #3280. I started as an Intern in the summer of 2015 in my junior year of college, while working toward my bachelor’s degree in Business Management and Economics. After the internship, I was offered an Assistant Store Leader position in 2016. I was later chosen to work on Accelerator Projects for GetGo, where I have implemented a variety of different initiatives into 30+ stores, working with 100+ Team Members and leaders to drive operational results. I like the involvement of the entire Company, diligently working on achieving the same goal, and supporting each other through the process. I like feeling that I am an integral part of the Company. GetGo is a company that appreciates my input and results. I also like that Giant Eagle promotes growth and motivates Team Members, who in return motivate their teams. The person who has helped me develop both personally and professionally in my career is Mary Kelly, the District Leader of GetGo, Region 304. She is an exemplary leader, from whom I have learned a lot. Her insightful advice, ideas and approach to work and life have helped me grow within Giant Eagle and achieve greater results. She and my former Store Leader trained me and motivated me to become a Store Leader. As a District Leader now, she continues to help me grow and is always there to support her team. I was originally born and raised in Tashkent, Uzbekistan and moved to the United States in 2009, without being able to speak much English or knowing much about the American culture. My biggest accomplishment is growing personally within the 10 years I have been living in the United States, learning the language, meeting new friends and becoming one of the youngest Store Leaders in the Company. My favorite leadership book is “Start with Why” by Simon Sinek. To keep my eyes not only on the end result of the goal, but also the journey that leads to it, enjoying small accomplishments and learning from mistakes. I am fortunate to have a great team, who make work feel like home. I have great friends and family who are very understanding of times when I have to stay longer to finish work, or when I have to prioritize work over some other things in life. Having a hobby, however, or something that interests you outside of work – always makes your work-life balance so much better. I enjoy yoga and boxing outside of work, spending time with friends and family is also very important to me. I speak three languages and am learning my fourth. My native and first language is Russian. I am also fluent in Uzbek and English, and am in the process of learning French. In Honor of National Women’s History Month: Meet Valery, Sr. Director... Introducing Giant Eagle’s Recruitment Marketing Dream Team!